We roll our eyes at the unique snowflake rhetoric, but just because it’s cliché doesn’t mean it isn’t true. Though we may saunter into this week as a people who have it all together, You see how our souls are stumbling. When will we learn to stop trying to hide from You? Reveal the complicated narrative of self-rejection that we have told ourselves all of our lives. Bring the false stories to the surface, we pray. Because for all the ways we’ve experienced healing, we know there is still much within us that remains unseen. Shine the warm light of grace into the shadows and be the courage we need to respond. Hold shame back with Your powerful hand and extend to us Your Father kindness, we pray. Though we are grown on the outside, we are small within. Embrace us in our littleness. As we turn our face to You, may we see our true selves reflected in Your gaze, not as a people who have a spirit of fear, but one of power, love, and a sound-mind. May we refuse to condemn ourselves as hypocrites simply because we don’t feel powerful, loving, or particularly sound of mind. Instead, may we embrace the truth – that a hypocrite is not acting contrary to how we feel, rather it’s behaving contrary to who we are. And in Christ, we are the loved and the loving. This is our truest story. Spin us back out into the world as people who know who we are. Surprise us with a joy we cannot explain. Go with us as we show up as ourselves in the presence of others. 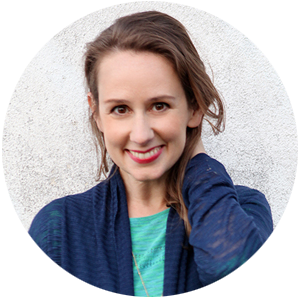 If you like what you see, sign up here for my monthly notes from the bench, where I’ll share books I’m reading, favorite things, and encouragement for your soul you won’t find anywhere else. Oh…. this is beautiful. And I needed to pray these words today. Thank you. I’m so glad these words found you at the right time, Alexandra. I needed to read this today as I sit here full of anxiety and fear of what I feel I cannot do. I am contemplating major life changes that could potentially bring so much joy and happiness but the journey will be long and hard and I’m not sure if I can do it. The thoughts of not enoughness are almost unbearable. But I know that He makes me enough. He already has. Thank you for your words. Thank you for sharing that, Lauren. Transition is hard and sometimes the fog of unknowing feels too ominous to step into. I hope you continue to feel convicted of your enough-ness in Christ. no, it’s the perfect idea!!!!! wow….so much powerful, holy, hopeful and freeing grace in these words. thank-you for consistantly pouring into the dry lands of my sometimes weary heart….i just can’t tell you how your god-given gifts impact me. thank-you. so. much. Well said, my friend. Thank you for reminding us how God sees us! Thank you for your kind and thoughtful words. You so graciously express what many of us wish we could. Oh Emily! The timing of this prayer is God-ordained. 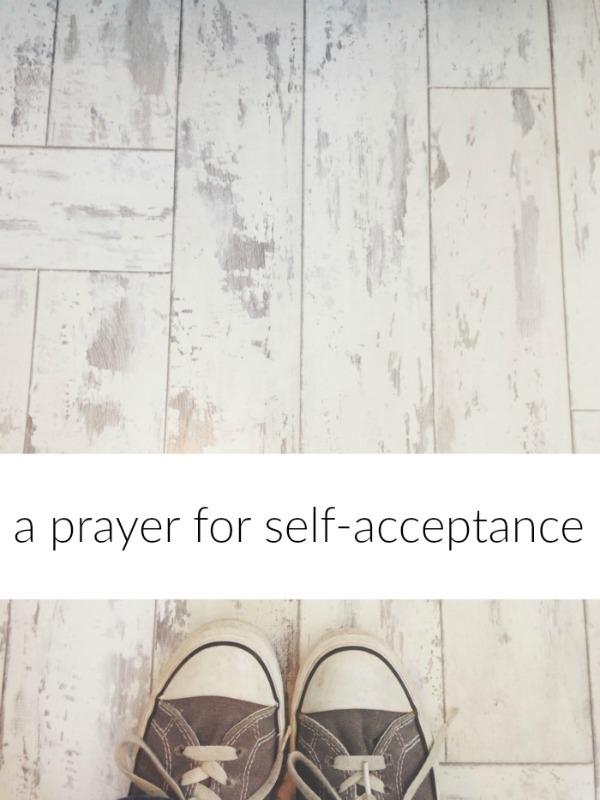 I was preparing my mind and heart for an extended one-on-one intercession with our precious Lord Jesus when I read this prayer of self-acceptance. It perfectly reflects my hopes for my prodigal daughter, for a friend who’s going through a bitter divorce, and for me as I seek God for renewed direction in my life. Thank you for leading us into a truth encounter with ourselves and with our compassionate Creator who desires to complete the healing work he has begun in each of us. Somehow your prayers always find the dark corners of my heart and mind at the perfect time, bringing much needed light and words to name the worries hidden there. You speak the language of my soul, and I’m grateful. Thank you. Beautiful and exactly what i needed today. So many times I have been soul-nourished from the words and prayers that spill from Emily’s heart and show up in my inbox. I just needed to say thank you! Thanks for this prayer, Emily. I find it so helpful and uplifting when you talk about who we truly are. Not something you often hear… More please!? … this prayer spoke tenderly to my heart. Thanks for another soul-reaching prayer, Emily. Interestingly enough, it seems that this is a similar message to a recent series at my church, in which we discussed frequently how important it is to find our security in Christ. Our pastor used a visual of pouring water into a pitcher, and reminded us that we need to be filled with Christ; rather than trying to fill our emptiness with so many other both “good” and “bad” things. My parents just left from visiting, and it seems my mom and dad just heard a similar message at their church, and my sister posted on Facebook recently about a new series at her church (of which her husband is the associate pastor), about finding our identity in Christ. I love it when I see or hear of God speaking the same or similar messages all over the place! This area is definitely under attack at the moment as I take a big step of faith and obedience. I love how God brings encouragement and reminders from many different sources. Thank you for your words each week. I praise God for you and your obedience to write out and send this prayer out today. It has been much needed and I have been searching for the words of what I needed to just pray for myself for weeks now. And He has provided, as He always does. Thank you for being the willing vessel! Sometimes we forget that we are enough just as God created us. Still we struggle with doubts, fear, insecurities, envy, selfishishness. Let’s trust that our God is a big God. It’s our faith that is small. We are daughters of the King and we are God’s rightful heirs. I pray we will remember who we are and that God is ( present tense) singing over us with joy. This is perfectly timed. I have been dealing with low self-esteem. Believing the lies of the evil one “dumb, stupid, ugly not good enough, etc.” Then God hit me with a bolt-I am made in His image. In the image of Christ am I made and He said it was Very Good! If I am in His image I can’t be dumb, stupid & ugly-for He is none of these. A friend and I were just talking about this last night. My self-condemnation is so much more intense than it should be allowed to be. Thank you for finding the words that my soul wants but sometimes can’t find. In the days leading up to my high school graduation I feel like I’m drowning in the midst of the endless list of things to do and decisions to make. As today has gone on exhaustion and sadness have crept up on me, and these words healed so much of what I was feeling. Thank you Emily! Christ is as constant today as He is when life feels simple and easy. Emily, this is beautiful. Thank you for writing it. “… people who know who we are.” I am breathing deeply those words as I am taking steps further into living vulnerably and authentically. I’m rejecting my inner people-pleaser and self-image gaurder, and letting the Lord say who I am. Thanks for these beautiful true words. So many true thoughts in one beautiful prayer… My favorite lines: “Though we are grown on the outside, we are small within. Embrace us in our littleness” and “Surprise us with a joy we cannot explain. Thank you for your words Emily. I’m snuggled with my cup of tea getting over a cold following my youngest child’s college graduation weekend. All my kids are grown on the outside, but still my littles! Thank you for this prayer. It’s still sinking into my heart and soul. Your writing takes a while for me to digest. That’s a good thing! I need time for the truth to really land. When it does, I always feel closer to God and closer to peace. Thank you. Thank you Emily for blessing me…I pray you continue to grow in the Father. It’s been only a few days of finding you and deep down my spirit sings of this something special that I have found.